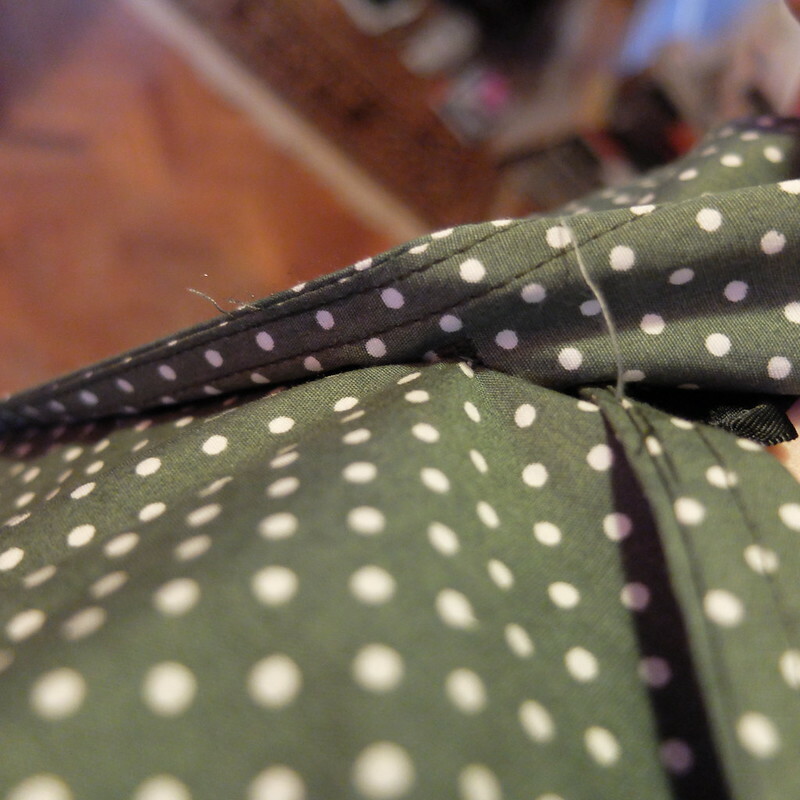 I have another review today of a Tara Starlet garment, following on from my previous review of their Bow Bodice top. 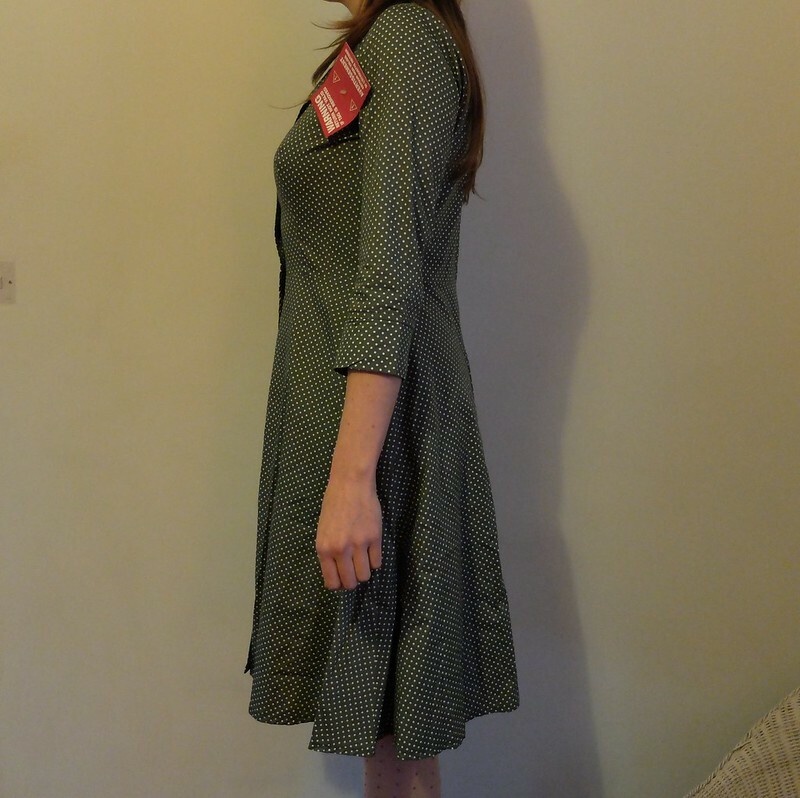 Today, I'm reviewing the Molly dress, which is a pretty day dress in a 1950s' style. I ordered the khaki colour in my usual size 12 in the pre-Christmas sale. Read on to find out what I thought about the fit, quality, and value for money. First impressions were that it is a lovely colour, slightly more olive than khaki, with subtle small polkadots in white. The fabric is a very light cotton, definitely what I would term 'summer weight' for the UK, despite having three-quarter length sleeves. 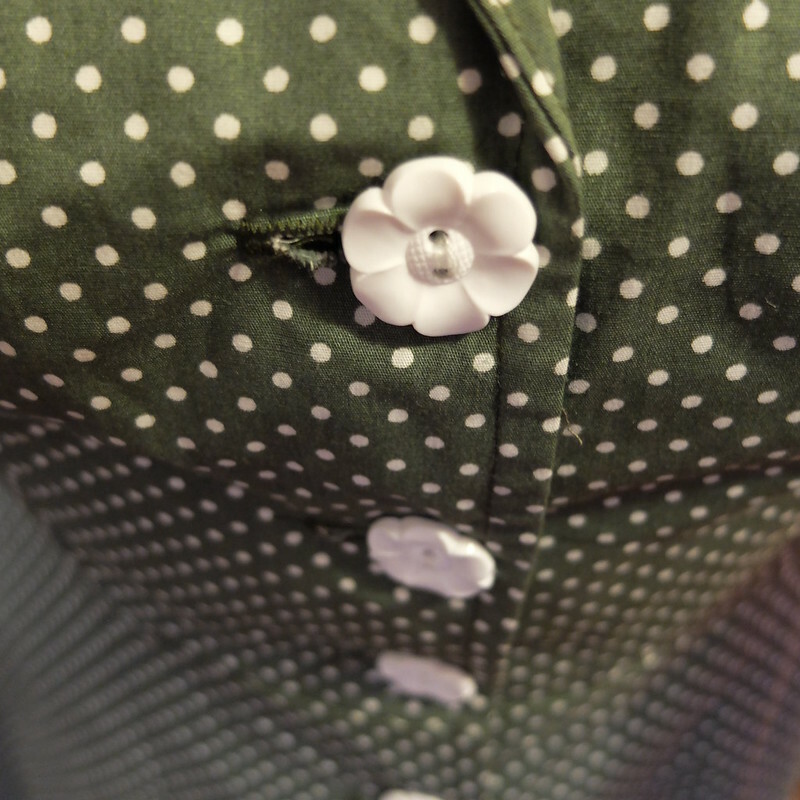 The flower buttons really are a sweet touch. In terms of fit, on the shoulders and across my bust the dress was snug but with ample ease. The waist seemed excessively large though, and without a belt or sash to nip it in, it just seemed to add a few pounds to my frame. I was confused, so I re-checked the size chart and then took out my tape measure. I found that although the size chart says a size 12 has a 30" waist, the waist on the Molly dress actually measures 16 and a half inches across flat, which makes it a waist of 33 inches - a whopping 3 inches more than it should be. 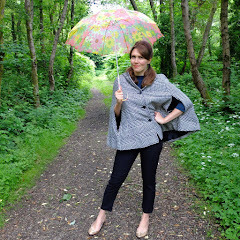 This explained, coupled with the boxy sleeves perhaps, why I felt more frumpy than starlet in this dress. Customer service said that they'd helped quite a few customers exchange the dress for a smaller size, which puzzled me, as that kind of information should be on the website in the garment description, surely? I was ready to love this dress, having debated purchasing it for most of 2015, but the more I then looked at it, the more I found to quibble over. 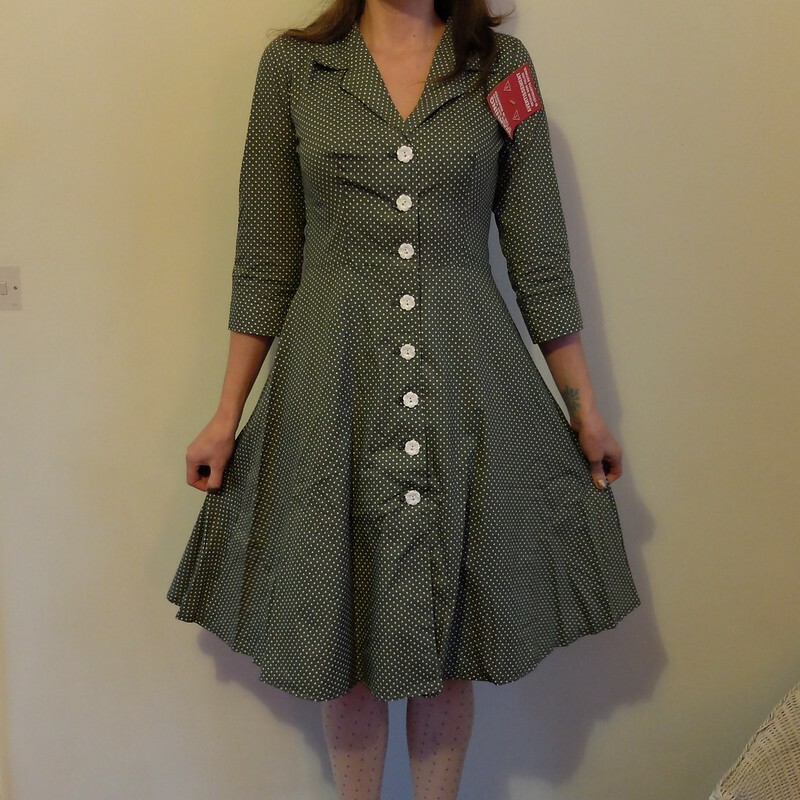 Length wise, it's just below the knee on me, but that feels a bit more '40s to me than the 1950s style intended. I also inspected the seams and buttonholes thoroughly and found quite a few loose threads waving about, and wasn't quite happy with the way the darts sat on my bust either. The Molly dress was originally priced at £75, which is fairly steep in my mind for a simple cotton day dress. I snapped it up at £37.50 in the sale (it was the free postage that finally caused me to press 'add to cart'), but even at that price, there are too many issues. 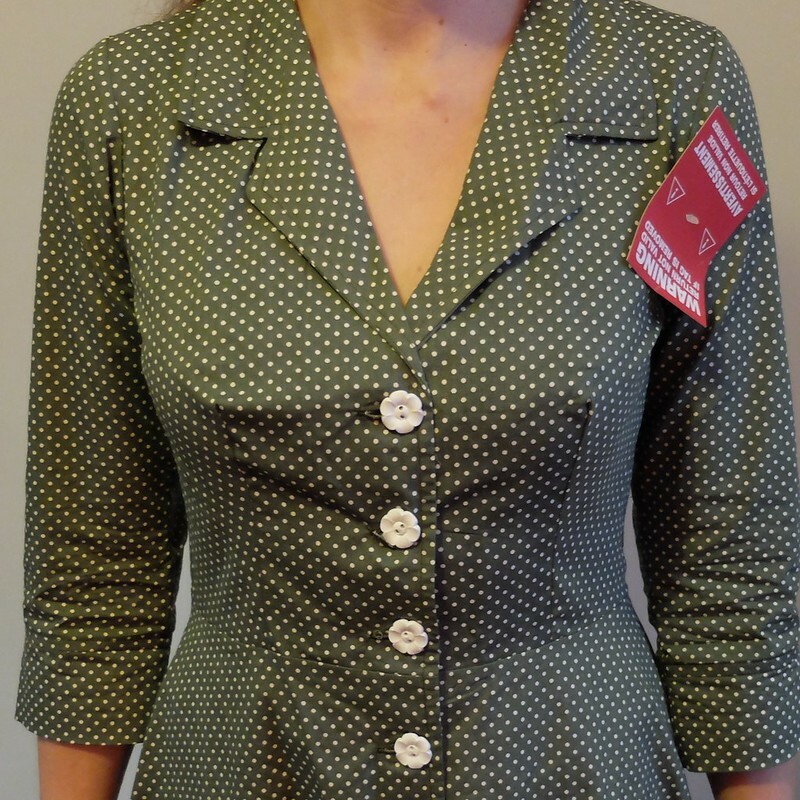 I tried it with a belt but it just didn't look right with the nice buttons down the front. The final straw was that my husband looked at me in horror when I said it had cost £40, and advised me that it looked like it was from a much cheaper brand, rather than being a quality, British-made item. My verdict: Return! As well as all the issues mentioned above, I was left a bit disappointed with the realisation that it wouldn't work across many seasons unless you layered it substantially with slips, knitwear and thick stockings/tights. I think I can put my best part of £40 to better use elsewhere. The Molly dress is still available in the Tara Starlet sale section in khaki, black, and burnt orange, and was at £37.50 at the time of writing this. "We did have a look at the top you sent back and unfortunately we couldn't identify a fault." So there you go, that's their final answer, but it's certainly not my last word. I'm currently awaiting a response from their head of production over the issue of the waist sizing being too big on the Molly dress and will report back as soon as I've heard anything! Hmm - I've never shopped with them as they don't go up to my size, but perhaps that means I've had a narrow escape. What a disappointment for you, though, to have to return another garment. So many disappointments lately Mim!! Am returning about 90% of purchases!! I used to like Tara Starlet before they started getting all trendy and were focused much more on vintage reproduction rather than a modern take on vintage. However, I never actually bought anything from them so couldn't comment on the quality back then. I would've returned this dress too for the same reasons you mention, even at the sale price. So many brands these days seem to think they can get away with shoddy workmanship and still charge a fortune just because they're niche. Sorry but quality and fit rule every time with me. 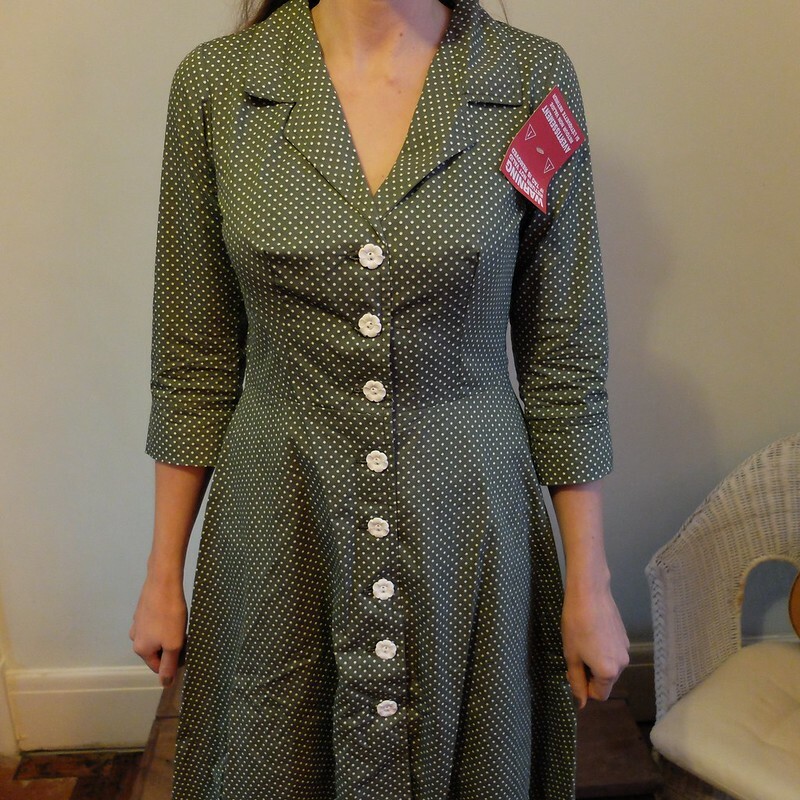 The dress itself looks lovely with the longer sleeves and gorgeous buttons, it's just a shame the fit is so badly off with it - it has such potential! I haven't ever bought anything from Tara Starlet before strangely, even though I've loved a lot of their stuff - I'll make sure to be careful with sizing if I do though! You've just addressed my fears of ordering online. Too many issues with fit and sizing. Also in Canada we are often charged duty and taxes and huge shipping costs. More often than not I find it's just not worth the hassle. I should tally up how much money I lost on postage in 2015 from returning faulty or badly sized outfits! I bet I could buy a knock-out frock with it all totted up! you fight the fight! I have had so many issues with waist sizes being wrong with repro brands recently sometimes in my favour, sometimes not. I think with a lot of brands they do generic waist sizing and then it is not the same across every dress. I understand that sewing is a complex thing, and that even using the same pattern but with different fabric, in a different factory, on different machines, could end up with sizing varying - that's fine, but just TELL your customers on the website that it's large/small compared to usual!! Great review! Their response to your bow top is hilarious though!!! 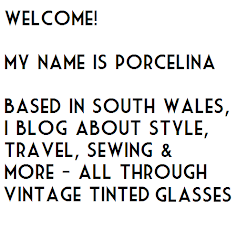 Glad I haven't shopped with them, shame though because their stuff is cute! I remain eternally optimistic, that one day soon they'll make something that fits me well and has no weird issues!! 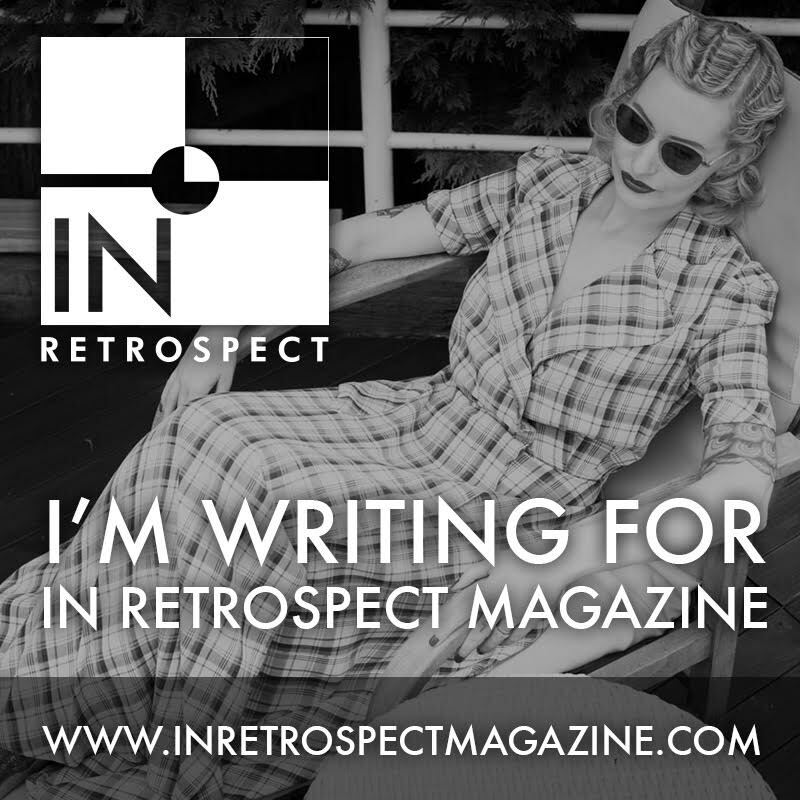 Agreed, there's a bit of a 40s/50 - almost 60s - mashup at work in terms of the cut and colouring. On a strongly 40s style the buttons (which I love, BTW) would suit the era well, but here they seem to up the 60s influences all the more to me. I'm sorry that this dress wasn't a winner for you, sweet dear. I've never bought anything from Tara Starlet, so I can't compare firsthand experiences, but I will certainly keep all of your helpful advice (it really is so sweet of you to share such detailed reviews with us) in mind if I ever do take the plunge with this brand myself. I actually have this dress in yellow, one of their earlier versions and am unsure how I feel about it. I find sizing tricky when shopping with Tara Starlet, I never know when I need to size up or down...so when I size down it will *always* be too small, and when I go a size up it's huge.... As for this dress, the sizing issue prevailed once more, it was too big. I feel like this dress really needed a matching belt...because I also tried styling mine with a belt as you did and couldn't make it work because of the buttons. Glad it's not just me! Sorry this one was a no go for you. I agree though that if you aren't 100% happy with it it's best to spend you money elsewhere. It is strange that it was such a light fabric for something that comes in a 3/4 sleeve and also that the waist fit so large. Those flower butters are really cut though! This is such a thorough review and while I'm sorry the dress doesn't work for you, thank you for sharing all that information! It's too bad when you really want something for so long and it doesn't live up to expectations one you finally are the plunge. I have always wanted to to try the Tara Starlet brand but I'll be sure to read the reviews and sizing after what I have read from you! I actually bought this in the original price (on a mad whim) and have regretted it, especially now that I could have it on sale price and I'm not rich, far from it. Should have returned it. The dress has been standing in my closet unused, but I'm thinking of either taking it in from the waist or changing the buttons to go with a belt.